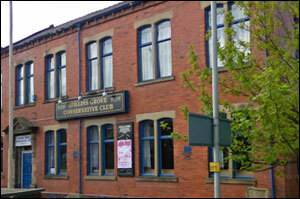 The Hollins Grove Conservative Club offers a warm welcome to all from the Steward, committee and all of the staff. We have arguably the best party venue in Darwen and Blackburn, with our recently refurbished Function Room suitable for up to 130 guests, which will grace any special occasion. See our Function Room page for more details. In addition to our Function Room, our Members Bar is well furnished with 3 Full Size Snooker Tables, plus a smaller (8’x4’) snooker table a sports TV Lounge, as well as pool and darts facilities. Guests are always welcome to come along and experience all of the Clubs facilities. We find that visitors very quickly see the benefits of becoming a member and enjoying all the Club has to offer. You can find out more details on our Membership page. Conveniently situated just off the M65, in the heart of Darwen and with easy access from Blackburn, Accrington and surrounding towns, you can get driving directions, or get to us using public transport by checking our Contact page. We now have a great useful links page packed with er…useful info?!! click here to view!